Of all the ways you can cook bacon—including on a skillet or griddle, in the microwave, or even in a deep-fryer—it turns out that the very best way of all is to bake it in the oven. Bacon is fatty, so it needs to be cooked slowly, at a low temperature, so that most (but not all) of the fat renders away while leaving the finished product crispy and golden brown. And you can try to do that in a skillet or a griddle, but there are a couple of problems. One, an average skillet isn't wide enough to accommodate whole slices of bacon. They'll just crowd each other and end up sticking together. But even if your skillet or griddle is extra-wide (or you decide to cut your bacon in half), you're still cooking the bacon from below, which is more likely to cause it to scorch. So it turns out crumbly rather than crispy. You're also going to have to flip it so that both sides of the bacon are cooked. Flipping bacon isn't a major challenge, but I think we can agree that having to flip your bacon is more difficult than NOT having to flip it. Plus, cooking bacon on the stovetop uses up one of your burners (or maybe two if you're using one of those double-burner griddles), which means you have less room for making your eggs, home fries, Hollandaise sauce, or even just boiling water to make coffee. Finally, cooking bacon on the stovetop is messy—bacon fat is going to spatter all over the place, maybe even onto you. Anyone of these—the fact that it's easier, that it frees up space on your stovetop and is a lot less messy—would be reason enough to cook your bacon in the oven. But it so happens that those are only side benefits because bacon cooked in the oven is the best bacon you'll ever have. The oven cooks it evenly so that it comes out crispy and, yes, perfect. Do NOT Preheat Your Oven! So here are the steps. But let us first give you a heads-up that the most important part of this technique is putting the bacon into a cold oven. Don't preheat! Starting with a cold oven ensures that the bacon will cook slowly like it needs to. Arrange the bacon slices on a sheet pan and place the pan on the center rack of a cold oven. (Try not to stretch the slices out. Just gently drape the bacon across the pan.) Close the oven door. Turn the oven on to 400 F. Walk away. Come back 17 to 20 minutes later. As soon as the bacon is golden brown, but not excessively crisp, it's done. The exact time will depend on the thickness of the bacon slices, and also on how quickly your oven reaches the target temperature. Remove the pan from the oven. Transfer the bacon to a second sheet pan (or a plate or dish) lined with paper towels to absorb any excess fat. REMEMBER: Don't preheat the oven! Make sure the oven is cold when you put the bacon in. Also, keep your eye on the bacon during the final few minutes of cooking to make sure that it doesn't burn. Another thing: Remove the cooked bacon from the hot pan right away. If you leave it in the pan too long, the heat from the pan and the hot bacon fat will continue cooking it. One of the lovely consequences of cooking bacon this way is that the bacon fat renders off beautifully. We'll pour the hot bacon fat into a heat-proof ramekin and save it in the fridge for other uses. And by "other uses," we mean everything. We'll sauté with it, cook eggs with it, bake cookies with it—seriously, anywhere you might use butter, you can use bacon butter. You can even spread it on toast, and although we've never tried this, we have a feeling a peanut butter and bacon butter sandwich would be kind of divine. You'll notice that since the fat doesn't burn while you cook the bacon, it'll be almost transparent when you pour it and have a lovely, creamy white color once it cools in the fridge. We used to strain the liquid fat through cheesecloth when we would pour it into the ramekin, but we actually don't mind having little bacon particles in it. They'll sink to the bottom in any case. Truly, sometimes we're not sure it's the bacon we're "making" and the bacon butter is the "byproduct," or if it's the other way around. What About Lining the Pan With Foil? The question of whether to line the pan with foil has come up occasionally. 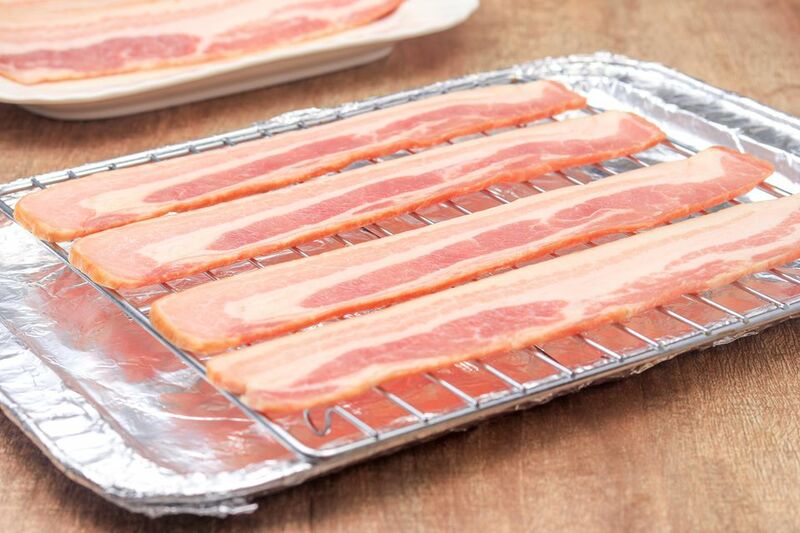 We don't use foil when we do our bacon, because we don't mind washing the pan later, and we find that the sheet of foil can complicate matters when we go to pour off the fat. Plus, that's a pretty big piece of foil, and maybe it seems a bit wasteful. Really, the foil is mainly about keeping your sheet pan (relatively) clean. One advantage of this technique, however, is that since we cook the bacon slowly and gently, it really shouldn't stick. However, if you find your bacon is sticking, try crumpling up the foil a little before you line the sheet pan with it. The little crumples in the foil will help the cooked bacon lift right off. That, or use parchment paper.